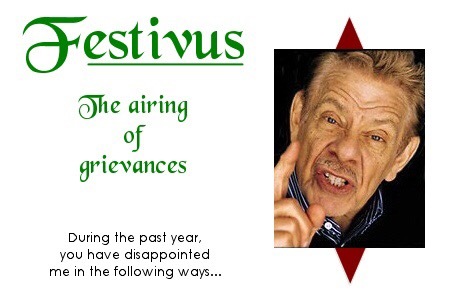 Festivus 2017 – Airing of Wine Grievances! Today, December 23, 2017, is the celebration of Festivus. Created in 1966 by Daniel O’Keefe and popularized during an episode of the hit TV show, Seinfeld, Festivus is celebrated with Feats of Strength and the Airing of Grievances. So, in that spirit, we’re here to air a few wine grievances. We’re looking to make this our one post a year that’s not entirely positive. So, sit back. Pour a glass and read on! Lack of hashtags in posts on social media about wines, wineries, vineyards. You see we’re big proponents of hashtags as a way to brand. So, all you #NCWine folks out there, USE THE DANG HASHTAG! Untrained tasting room staff. There’s nothing worse than a tasting room staff who know nothing about the wines they are pouring. We understand that getting good help can be difficult, but a poor experience affects your brand. People who only drink dry wine. You’re missing out on some really great sweeter wines. People who only drink sweet wine. Again, most of the wine world is not sweet. You’re missing out on a lot more than those who only drink dry wine. People who only drink Chardonnay or Cabernet or Merlot. Give us a break! We’ll try pretty much anything. We’re all into to food and wine pairings. Chardonnay with steak isn’t exactly the best match. A big, bold Cab with sea bass probably doesn’t work so well either. So, keep an open mind and try something different! People who constantly bash muscadine wine. We get it. Muscadine wine is different. There’s a distinctive foxy quality in a lot of muscadine. We’re not big fans of red muscadine, but we won’t turn up our noses at it. You shouldn’t either. Find some that are well made. Maybe one that isn’t so sweet and try it. You might be surprised! People who think all US wine comes from California. Yes, California is responsible for 85% of the wine produced in the US, but if you’re only drinking Napa Cab, you truly are missing out! People who think cider is more akin to beer. Repeat after us! Cider is NOT brewed! It’s fermented! Thus, it is like wine! Just because you often see is on tap doesn’t mean it’s beer. Wine can be served on tap too. We’d like to see more of that! People who think mead is more akin to beer. Mead is honey WINE! It’s fermented. It’s typically bottled in WINE bottles. If you’re drinking mead, you’re drinking WINE! People who think all cider is sweet. Cider can go the range from super sweet to super dry. Again, don’t be afraid to try even if you don’t think you’ll like! People who think all mead is sweet. Just because mead is made from honey doesn’t mead that it’s all sweet. Yes, it will almost always have a flavor of honey, but that’s different than sweet. 2017 wines that are already out for sale. Harvest just happened a few months ago. There are a few exceptions to this, but as a general rule, wine needs time to age, even white wines. Don’t rush it out! Shiny black labels on a wine bottle. They look great, but they’re very difficult when it comes to taking a picture of the bottle. There are too many glares and reflections. Matte is the way to go! So, that’s our list for this year. Here’s hoping next years list is shorter! And keeping with this theme, leave us your comments of what’s your grievances are. Just avoid personal attacks.